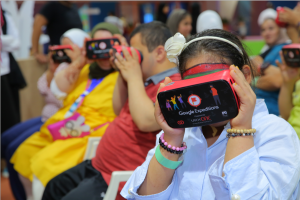 MANAMA, KINGDOM OF BAHRAIN, August 15, 2018 /EINPresswire.com/ — VR has truly disrupted the conventional therapeutic techniques and protocols coming to forth as an assistive technology that helps children with disabilities like Autism Spectrum Disorder (ASD), on a personal level and enables to remove some of the physical limitations that get in the way of their learning and development. Floreo, a VR company, specialized in ASD, is now penetrating its way in the Middle East to bring groundbreaking innovation in the Special Needs Education sector by offering VR learning tools designed to help improve social cognitive skills in autistic children. Co-founder & CEO of VRXone and the ARVR & Ai Strategist MENA, Dr. Sana Farid belives that VR has transformed the domain of Special Needs Education forever, "There is a lot to be said about the way Virtual Reality has revolutionized the Special Needs Education by providing a customized approach and a unique set of learning and growth opportunities for students with disabilities, which was not possible before." Previous Previous post: AuthorCentrix Magazine Features A Renowned Chef!